We are a family owned and operated business, where we strive to give the customer excellent service and gratitude. We have the best prices in the industry, which means huge cost savings for you! As a consumer with many options, when it comes to shopping, the choices can be overwhelming. 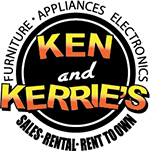 When it comes to renting furniture, appliances, computers and electronics, Ken and Kerrie’s is your best choice. Choose from our great payment plan options to fit your needs! Our Cash & Carry program gives you the opportunity to furnish your home on your budget offering your great discounts when you pay cash for anything in the store. Don’t have all the cash up front? That’s okay! Take advantage of our 120-day same-as-cash program and don’t pay any interest for the first 120 days! Just make your first payment and pay it off within the first 120 days and save a ton! No Credit Check, No Deposit needed! Our Rent-to-Own program is our most popular program. No Credit Check, No Deposit Needed! Just make your first payment and choose from weekly, bi-weekly or monthly low payments! With Ken and Kerrie’s your will never be locked into any contract! Return your items at any time with no penalties! Ready to update your home? Contact us today and let us help!